Baltimore, MD, June 27, 2016, Patricia L. Highcove, Vocational Consultant for Highcove Consulting, has been recognized by Elite American Executives for dedication, leadership and achievements in vocational consulting. Over the course of 35 years in her field, Ms. Highcove has learned to adhere to one guiding principle: never take a person at face value. This important lesson informs her work of finding suitable occupation for people whom society would simply classify as disabled. A vocational consultant, she counsels individuals with various physical and cognitive disabilities, helps them to identify their strengths, and focuses on a return-to-work strategy. The eponymous principal of Highcove Consulting, she assesses clients’ skills and conducts training, in addition to developing business plans that include the formulation of organizational structure, job descriptions, budgets, daily operational routines, and hardware and software needs. Proud to be practicing independently since 1997, Ms. Highcove previously served as a senior executive of The Guilford Group. She also lent her talents to Intracorp, where she occupied the positions of territory director, field service manager, and rehabilitation specialist. Further, Ms. Highcove also honed her skills at Maryland Rehabilitation Center, Alliance, Inc., and Merrimack Valley Rehabilitation Center. An alumna of Syracuse University, Ms. Highcove earned a Master of Science in rehabilitation counseling in 1982 and a Bachelor of Science in rehabilitation services in 1981. She became a Certified Case Manager in 1990, a Certified Rehabilitation Counselor in 1987, and a Certified Vocational Evaluator in 1983. Ms. Highcove is a member of the International Association of Rehabilitation Professionals, and a board member and former president of the Chesapeake Association of Rehabilitation Professionals in the Private Sector. She is a generous supporter of the Special Olympics. Patricia Highcove was originally selected for inclusion in EliteAMERICAN Executives in June 2015. 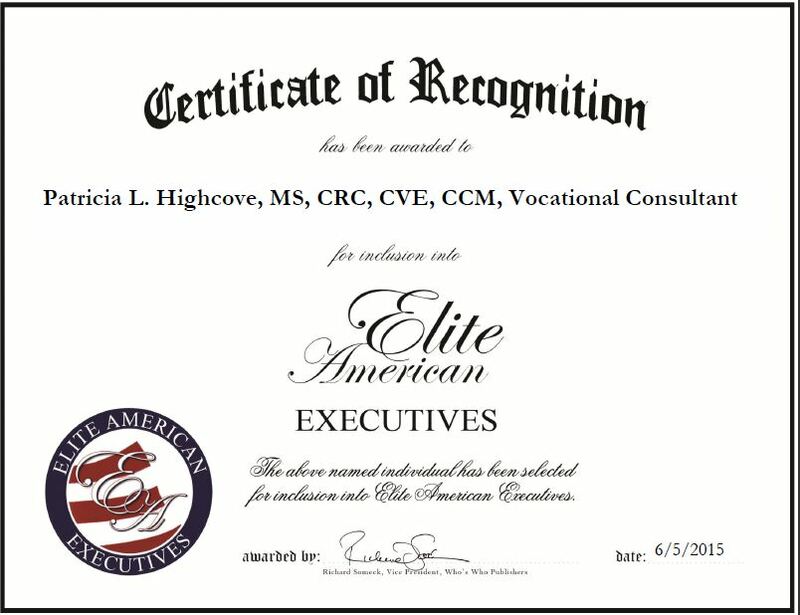 We are proud to be featuring Ms. Highcove again in EliteAMERICAN Executives for 2016. This entry was posted in Consulting and tagged counsels, organizational structure, physical and cognitive disabilities, training, vocational consulting. Bookmark the permalink.